Heartland Community College truck driving training student Holli Hays at the wheel. Heartland Community College truck driver training students Daun Greif, Sevin Headley and Holli Hays. Heartland Community College training trailer in Normal. Dashboard in the cab of the Volvo semi-truck used by Heartland Community College for training. Heartland's 160-hour Truck Driver Training course prepares students to obtain a Commercial Driver’s License. Semi-truck and trailer used by Heartland Community College to train truck drivers. The cab of semi-truck pulled up to expose the engine. The American Trucking Association estimates the industry is short at least 50,000 drivers nationwide. The association estimates that number could triple by 2024 as older drivers retire. This presents an opportunity for those with only a high school diploma willing to invest a few months of training and a few thousand dollars to earn middle class money. A number of central Illinois women are taking advantage of that opportunity. 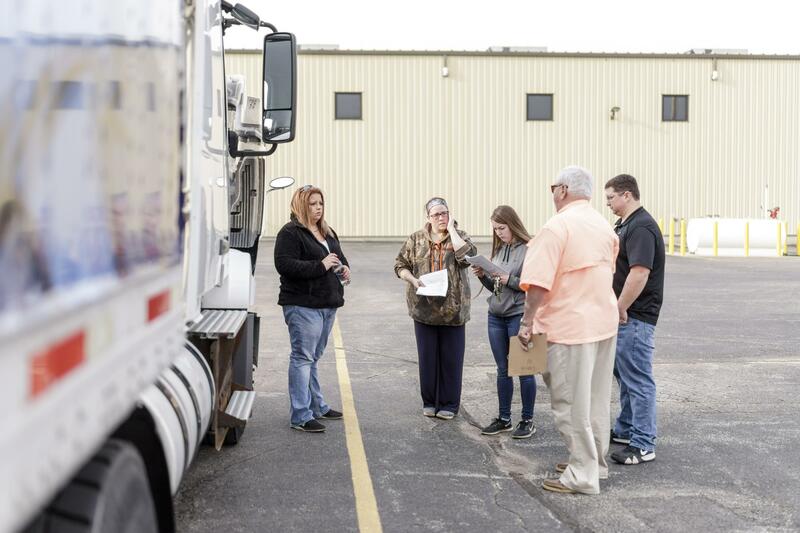 The large parking lot on the south side of Midwest Food Bank in Normal is where Holli Hays, Sevin Headley, and Daun Greif gathered during week four of their truck driver training through Heartland Community College. They’re working toward a Class A Commercial Driver’s License. On this pleasant spring day, instructors Dave Keim and Devin Davis are fielding questions from the three as they inspect the Volvo semi-truck and trailer sporting the Heartland Community College logo ahead of a training run on Bloomington-Normal streets. Bloomington’s Hays is typical of many who get into trucking. The allure of a nationwide median salary of $45,000 is three times the federal minimum wage; the median $86,000 salary of private fleet drivers can quickly put someone solidly into the middle class. Hays currently drives a school bus part-time in District-87. Debbie Hale from Pontiac currently drives for Hudson-based Nussbaum Transportation. Debbie Hale of Pontiac completed her training through Heartland last year. “I guess it was making a decent salary,” she said when asked why she got into trucking. 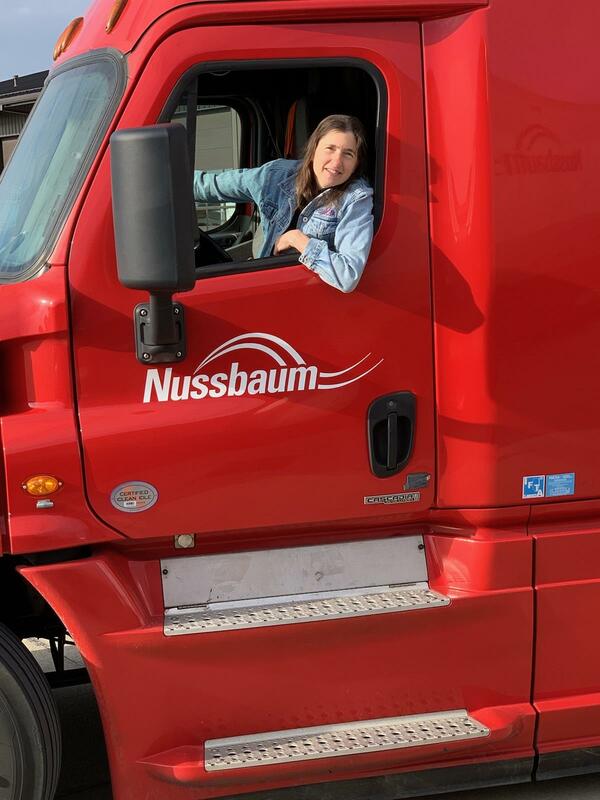 Hale currently drives for Hudson-based Nussbaum Transportation, and was in Illinois driving between Champaign and Peoria when she pulled over to talk. Like Hays, she drove a school bus. But she switched to big rigs after she and her husband were in a traffic accident, and he lost a leg. “My children were grown and I’m like, ‘I need to do something besides driving school bus. I need more income,’” she said. That refrain is a pretty common motivation. Ellen Voie is president and CEO of the Women In Trucking Association Inc., a Wisconsin-based nonprofit industry group that takes dues from both truckers and trucking companies. “Money is the No. 1 reason women come into the industry,” said Voie. Somewhat surprisingly in this still very male-dominated business, Voie said there is no gender pay gap, as drivers are mostly paid by the mile. Voie is hinting the attributes women bring to truck driving make them a logical recruiting target for truck companies, and a chance for many to bring home a decent paycheck. Desiree Ann Wood said that money can look pretty inviting. “But we don’t work 40-hour weeks,” said Wood on her headset as she was driving through Lancaster, Pennsylvania, on her way to south Florida. Wood is president of the advocacy group Real Women in Trucking Inc.
“We work 70-hour weeks on the books. But we do a lot of unpaid labor off the books, which can be another 20 or 30 hours. That’s a lot of work for $55,000 a year." Wood is also an owner-operator, and mostly a long haul driver that negotiates her own rates. She said the $55,000 figure is likely high for especially those early in their career. She concedes salaries can be higher for private fleet drivers, but cautions most companies will only consider hiring those drivers after they have driven a couple hundred thousand accident-free miles. Back to the metrics. Female truck drivers as a whole are statistically more productive and safer than their male counterparts. Ellen Voie said the science of the fear response helps explain that. “Just because we activate the amygdala faster. We’re more team oriented,” said Voie. And she said testosterone can sometimes work against male truckers. And they tend to stay with a company longer. Driver Debbie Hale of Pontiac isn’t surprised by the safety numbers. Back at the Midwest Food Bank parking lot, instructor Devin Davis of Strawn worked alongside Keim with the students. Davis is well aware of the positive safety and efficiency metrics for women. He also notices female students approach learning differently than men. The students eyed each other when aprised of Davis's comment and said that has not always been true. “I think we’ve all been pretty hands on and just ‘went for it,’” said Greif. “We’ve all killed the truck a couple times and ran over some cones,” she added as the three shared a laugh. Davis also said trucking companies are telling him they want more female drivers. “18-year-old men, they’re not good drivers. At least 18-year-old women would be better at it,” said Davis. Still, recent statistics show women make up just 6% to 8% of non-male truck drivers. It’s a number that has nudged up from 4% in 2010. Why, despite the trend is that number low and sticky? One reason is the nature of the job. Long haul drivers can be away from home for days or weeks at a time. With women still considered primary care parents for children and the elderly, long-haul trucking can be impractical. Students Holli Hays, Daun Greif, and Sevin Headley working with trainers Dave Keim and Devin Davis. Desiree Ann Wood of Real Women in Trucking said driving an 80,000-pound vehicle through snow, wind, and rain can also be a deterrent, as can other more mundane daily routines. “You’re not going to be able to have a shower every day. You might have to brush your teeth with a cup of water out in the parking lot. There are a lot of luxuries that are going to go away because your life is living around a load,” explained Wood. Then there’s the safety issue, both personal for being on the road alone for long periods of time, and professional. As fleet operators continue to struggle filling available truck driving jobs, training companies and finishing schools run by those fleet operators also struggle to find trainers who can pass background checks. Wood said isolation in a small cab with someone who has the power to decide if you make the team has led to some unsavory results and lawsuits. Indeed. Dan Rather’s investigative reports from 2013 highlight shortcuts taken by training organizations, and laws that allow that to happen. To attract more female drivers, carriers say they are offering more practice time in truck driving simulators. They have added internal support groups, female driver liaisons and trainers. But Wood said more female trainers aren’t necessarily the answer. Debbie Hale said her employer, Nussbaum Transportation, has been very supportive. She believes the dominant share of male truck drivers and the isolation she can feel on the job make it important women not only have support groups, but other women to offer that support. She related a couple incidents where she felt her safety was at risk. But she said she has also received support from other male drivers in her short six months on the road. “Like especially when I first started. You know there has been some guys who are like, ‘Hey are you doing fine,’ or ‘I’ll help you out’ in little ways. And I’ve been appreciative of it,” she said. Those are some of the internal challenges forward thinking trucking companies are trying to iron out to create a welcoming environment for women. Ellen Voie of the Women in Trucking Association said companies are also beginning to understand that if they want to attract women truck drivers, the message has to resonate. “I actually wrote a blog called ‘Women Are Not Small Men,’” she laughed. “The companies that don’t ‘get it’ want to assume women will adapt to the male-dominated environment." A scan of trucking firm websites either listing Bloomington-Normal as home base or national firms with locations in town reveals those companies aren’t yet including women as at least one of the faces of trucking. Just one company included images of females in truck driver or non-office positions. A couple websites show men of color. There are a lot of images of white men. Voie said there are also still a lot of marketing misses in recruiting ads. Despite that, women are still entering the truck driving business. In addition to a respectable salary, truck drivers say it’s a great way to see the country. For example, Driver Debbie Hale said she fell in love with the landscape of central South Dakota. “And I was with my trainer and looking around like, ‘Oh my gosh I love this I want to move here.’ When I came home and, ‘Oh I love South Dakota I want to move here!’ And my husband is like, ‘No, absolutely not,’” she laughed. Heartland student Holli Hays also anticipates seeing the country once she earns her CDL. “I like the open road … I like listening to my music. I love my kids, they’re great. It’s going to be sad to leave them behind, but I’m just fine by myself,” said Hays. Companies and drivers occasionally use other ways to make truck driving welcoming. Heartland student Daun Greif lives in Chenoa and said she wants to use her Class A license to form a long-hauling team with her soon to be husband, driving for Hinton, Iowa-based Weinrich Truck Lines. “And we don’t get to spend enough time together, so we decided this was a great way to see the world, because we’re both young enough to do it. And everything on the continent is fair game,” said Greif, who added Weinrich was on board with the idea. “As long as I pass all my background checks. They hired him with the intention that we would be coming as a team, eventually, once the school year was over,” said Greif. Ellen Voie said there are a number of husband/wife team drivers in the U.S. One is often sleeping while the other is driving, so they don’t spend as much awake time with each other as you’d think. But she said team drivers can make a lot more money because they can go a longer distance ... faster. “The government has hours of service regulation so that if you’re a solo driver, you can’t be over 14 hours on-duty,” said Voie. “But if you’re a team and one of you is driving for 12 hours and the other is driving for 12 hours, you can move that freight pretty fast. Students Sevin Headley and Holli Hays inspecting the truck before training on Bloomington-Normal streets. The third trainee this semester at Heartland Community College intends to utilize her CDL short term. Sevin Headly hails from Fairbury and graduated from Prairie Central High School in 2015. She is also a junior accounting major at Illinois Wesleyan University. Headly actually passed the written test two years ago, but let it expire when family members were too busy to train her. “And then I came here and got my permit again, and now I’m learning how to drive. Real Women in Trucking founder Desiree Wood has pointed critiques about the industry and advice for drivers. She said women with small children, or young women who plan to have children should really think it through before signing up. She also urges women to do their own deep background checks on the trucking companies and training companies before applying to learn the culture they would enter should they sign on. In her experience, she said, companies that advertise the most, are the worst. “And the ones that are actually the best get very little exposure,” said Wood. Wood also strongly advises especially women to deep dive into the industry as a whole to understand exactly what they are getting into. But she closes by saying trucking is an honorable, purposeful job. She said knowing food on supermarket shelves and products in other stores are there because people like her drive across the country through all sorts of conditions is a feeling difficult to replicate in other jobs. Six months removed from her Heartland Community College training, Debbie Hale of Pontiac echoes Wood. “To me, I feel like we are a big part of this economy. I saw a sticker last week that said ‘if you don’t like truckers, don’t buy stuff,’” said Hale emphatically. The City of Bloomington has suspended its business registration program. The Bloomington-Normal area economy has lost 1,300 jobs in the past year, helping drive up the unemployment rate, the Illinois Department of Employment Security reported Thursday.